Sad incident happened yesterday outside Chinnaswamy Stadium in Bengaluru where thousands of fans were beaten brutally by the police just because those fans gathered there to get the ticket of India-England ODI which will going to be played on Sunday. We say we are democratic country but I believe we still live in British Raj. Story is the same as it was in British Raj, people were beaten in that era by British police and people are beaten in this era as well. But actually it is fault of the people that they went to Chinnaswamy Stadium in a hope to get the few tickets for the match as we Indians consider cricket as religion and players as GODS. In British Raj, ‘Indians and Dogs’ were not allowed for any big occasion or in specific places in their own country and now poor and middle-class Indians without contacts and money are not allowed. What kind of independence it is? Its ridiculous to see so many fans were lathi-charged and our administrators didn’t utter a word. 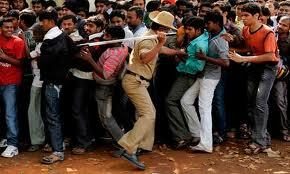 It was unfortunate that fans who waited for the ticket for hours were beaten brutally like animals. Incident becomes even more shameful, knowing that Karnataka Cricket Association is headed by one of the legends of Indian cricket in Anil Kumble. It was not expected at least from Anil Kumble, whom cricket fans adored for so many years. It was disappointing to hear from our own Javagal Srinath, that they can’t handle people and can’t give tickets to everybody. Mr. Srinath understand one thing, cricket in this country is driven by fans and if you keep fans away from the cricket than this game will die soon. Matter also becomes more serious because even after so many fans were beaten and hospitalized, Anil Kumble didn’t came out and expressed his apologies over the incident. Shame on you Mr. Anil Kumble, you were my hero till yesterday but now you are nothing to me. Now coming to the core issue of non-availability of tickets for the matches. ICC already expressed its disappointment over ticket distribution. ICC wrote letter to its own President and questioned his ability to manage the ticket distribution in a fair manner. This is also very shameful for the country that one of tis cabinet minister who is holding high post in World’s highest cricket governing body is questioned by its own peers. You can understand from the fact that in cricket crazy country, only 10% to 30% tickets are available for the general public and rest of the tickets are distributed as complimentary to the politicians, bureaucrats, sponsors and affiliate members of the respective boards. So our so called administrators deprive the general public from watching the match in the stadium because they don’t have influence to get the tickets. Moreover pricing of the ticket is also so high that common-man can’t buy it. Moreover, people who wait outside the ticket-window for hours are treated shabbily and lathi-charged as they are criminals and committed some big crime. Understand one thing where Sharad Pawar exists, corruption and mis-management also exist. In fact, corruption and mis-management is synonym to Mr. Pawar. 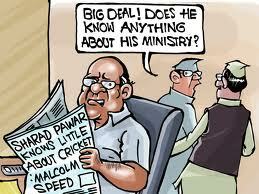 Mr. Sharad Pawar has done no good to the people of this country as a minister and also as a ICC President. He always looked after his own benefits and rake in moolahs for his relatives and for himself. Food prices rise consistently under Pawar's regime and common-man is also deprived from watching the cricket and still he exists as a authority. I believe people like Pawars and Kalmias should be punished heavily instead of common people but that will not going to happen because India is a one such country where if you have power you can do anything. There are only 4000 tickets available for the World Cup finals in Wankede Stadium, Mumbai. Capacity of Wankhede Stadium is 32000 and for common-people only 4000 tickets are available and those are also priced heavily. So this clearly indicates that watching cricket in a stadium is only for the VVIPs and billionaires and really this is big injustice to the common-man. Mis-management of the tournament organizing committee also reflects in their selection of the stadiums. In Mumbai there are 3 stadiums and among all of them DY Patil stadium is having maximum seating capacity of 55000 yet Wankhede Stadium was selected for the World Cup final just because Sharad Pawar led MCA owns it, though its sitting capacity is almost half of the DY Patil Stadium. The match for which lathi-charge massacre happens yesterday was originally scheduled to be played at Eden Gardens, Kolkata which is having capacity of accommodating more than 100,000 spectators but because of BCCI’s internal politics match was awarded to the Chinnaswamy Stadium which is having sitting capacity of just 42000 and out of 42000 tickets only 8000 were available for the general public. I believe whatever happened outside Chinnaswamy Stadium has left big blemish on the face of cricket administrators of this country and such incident was not expected atleast in the Kumble regime.